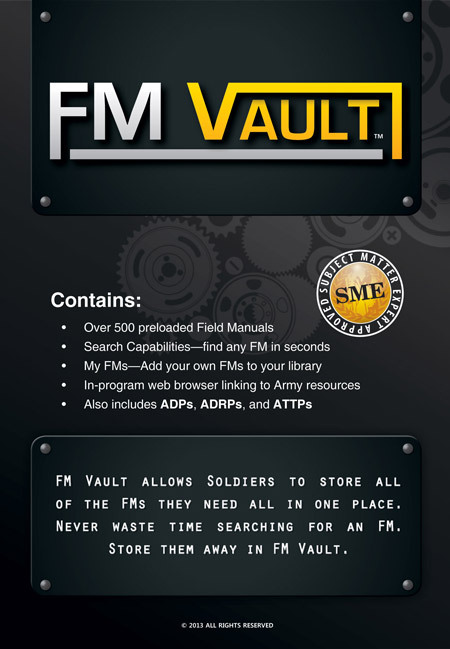 FM Vault provides you one place to find all of your U.S. Army Field Manuals. Never waste time on APD and RDL searching through lists of documents looking for the right document. Now you can simply store them away in FM Vault. The software comes preloaded with over 500 FMs preloaded and also allows you add your own FMs that may not have been available due to distribution restrictions. This program also helps track superseded field manuals for your reference.